Discount available! Recommend micro:bit prototyping to your friends and get your Discount. 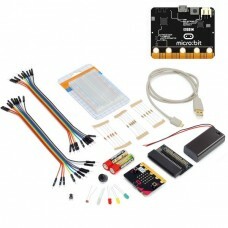 Kit containing a micro:bit card, a micro:bit connector board, a USB-micro cable, a battery holder for 2 AA batteries, two AA batteries, a 400 contacts breadboard with self-adhesive base, 5 mm RGB LEDs, 5 volt buzzer, 10 male-male jumper, 10 jumper male-female, mini switch, red LED 5 mm, green LED 5 mm, yellow LED 5 mm, 5 resistances of 2.2 kohm, 5 resistors of 10 kohm, 5 resistors of 47 ohms, a photoresist. 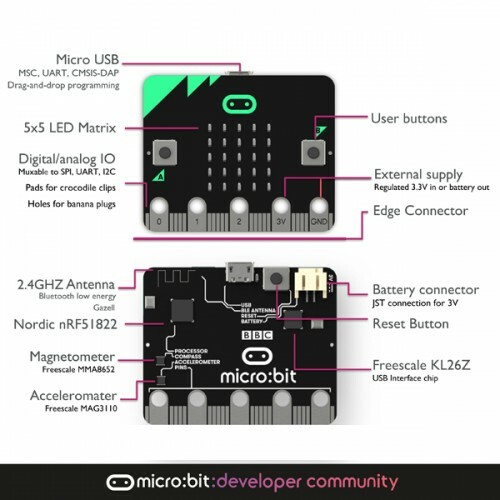 micro:bit contains a 32bit microcomputer, a motion sensors, an electronic compass, a Bluetooth module, a good number of I/O, some switchs and a matrix array LEDs for developing graphics interfaces in a 4x5 cm base. Communication with micro:bit by USB is managed via software with a dedicated stack encoded in the KL26 interface firmware, which includes an ARM Cortex M0 32bit CPU and 16MHz clock, 32KB of Flash ROM and 4KB of RAM. The software stack allows you to see the micro:bit from a PC as an external mass memory, such as a USB stick. This feature allows you to transfer software from PC to micro:bit simply by dragging the file from the source folder to the root folder of the micro:bit. You can also use the USB connection as a serial connection for transmitting and receiving data from external devices like other micro:bit, microcontrollers and PC. To simplify the task for those who want to move the first steps in the programming field, a web simulator has been made available to allow you to write and test your programs before downloading them onto the micro:bit. PYTHON: has been and is still in development to allow programming of microcontrollers in a language compatible with Python. The opportunity to use the Python language allows continuity, in a hypothetical didactic path, to the use of more complex systems such as microcomputers that can host GNU / Linux, such as the Raspberry Pi series. MICROSOFT BLOCK EDITOR: is a visual editor very much like Scratch and represents the starting point for those who want to start programming. As Scratch is very simple to use but it is not a toy. Allows you to deepen structured programming and event management. The method of composing a program is to choose the blocks that represent the instructions, drag them in the editor panel, configure them in customizable parts, and "paste them" correctly. 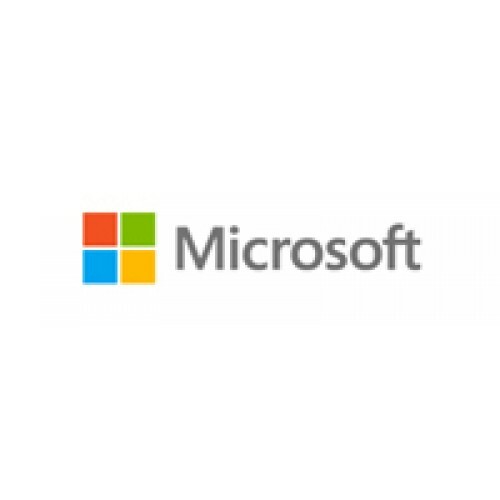 MICROSOFT TOUCH DEVELOP: has been developed to make micro:bit programs using a tablet or other devices equipped with touchscreen. Obviously, it can also be used by normal PC using keyboard and mouse. The micro:bit has 25 individually-programmable LEDs, allowing you to display text, numbers, and images. There are two switchs on the front . You can detect when these buttons are pressed, allowing you to trigger code on the device. A reset and restart switch. An accelerometer measures the acceleration of your micro:bit; this component senses when the micro:bit is moved. It can also detect other actions, e.g. shake, tilt, and free-fall. A compass detects the earth's magnetic field, allowing you to detect which direction the micro:bit is facing. The compass has to be calibrated before it can be used. A USB interface allows you to connect the micro:bit to your computer via a micro-USB cable, which will power the device and allow you to download scripts onto the device. A connector for external power supply. A BLE (Bluetooth Low Energy) antenna allows the micro:bit to send and receive Bluetooth signals. This allows micro:bit to wirelessly communicate with PCs, Phones, and Tablets, so you can control your phone from your micro:bit and send code wirelessly to your device from your phone! Before using the Bluetooth Antenna you will need to pair your micro:bit with another device. Once paired, you can send scripts wirelessly to your micro:bit. Temperature sensor, this sensor allows the micro:bit to detect the current ambient temperature, in degrees Celsius. Robotic base consisting of two chassis made of transparent acrylic material, two mo..